NASA’s Apollo program astronauts are more often hailed for being some of the world’s greatest explorers, adventurers, pilots and scientists, but rarely are they portrayed as some of the world’s most important photographers. ‘Apollo VII – XVII: A collection of photographs taken by NASA’s Apollo program astronauts 1968 – 1972’ is a soon to be released photography book that revisits the iconic images taken by the astronauts of NASA’s Apollo program, 1968 – 1972. The book contains an introductory essay written by Apollo 7 astronaut Walt Cunningham, sharing his memories and stories on early space exploration photography from the Apollo program. Photography has become a crucial technique for documenting the history of mankind. The early exploration of space is one such historical event, unrivalled among humanity’s achievements. Fortunately, the skill and daring of a very particular group of ‘photographers’, the Apollo astronauts, were able to bring back beautiful, moving and instantly recognizable images. It is these images that created a new understanding to what it means to be human, living on this planet and its relation to the sun and the stars. This book presents 225 of these photographs in large print format for the first time. Bringing them to life and restoring the color from the original scans of 70mm film the astronauts shot during their missions. 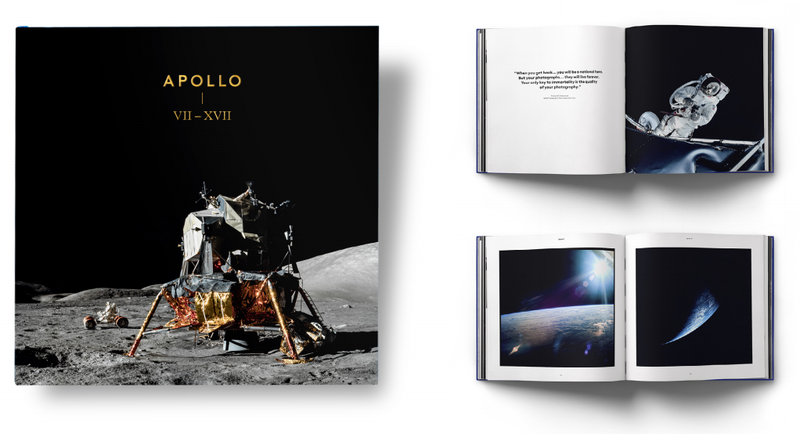 Many of the program’s iconic photographs can be found in this book, but the differentiating aspect of this book compared to other Apollo books is that many of the images have been picked for their photographic merit rather than their scientific or historical value. Many of these pictures have never been put into print before. the foundation for his fellow Apollo astronauts such as Anders, Armstrong and Cernan to capture some of the most well-known photographs, like the ‘Earthrise’ over the lunar surface, the first footprint on the moon or the iconic ‘Blue Marble’ capturing the whole of the Earth in one delicate frame. This essay, as Cunningham mentions, is the first time he has written his memories on this topic in print. 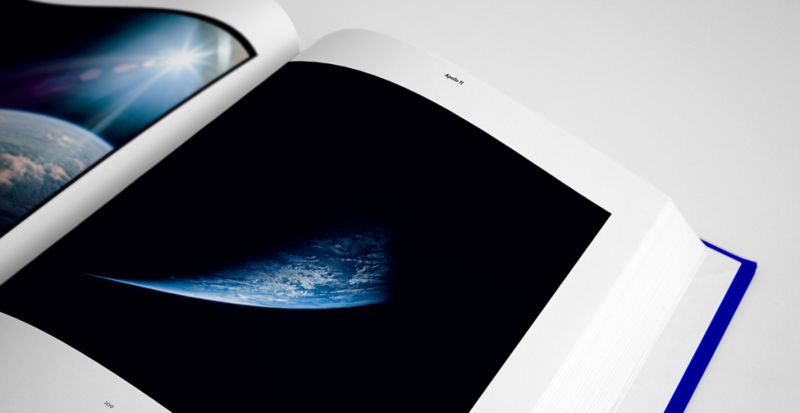 The large format book is 11.8 x 11.8 inches (30 x 30cm) in size and weighs over 6lb (3kg). Over the 320 pages, it contains 225 large format photographs, Walt Cunningham’s essay and a chapter dedicated to giving background information on the photographic equipment and the training and technique the astronauts undertook in order to create these beautiful images. This book is an initiative from four Art Directors and Copywriters working together at an Creative Agency in Amsterdam. Already having a keen interest in the Apollo program photography, they have had a longing for a large, beautifully printed photography book for as long as they can remember. The book they wanted didn’t really exist in the form and standard that they were looking for. This eventually led them to create the book themselves. Funding for the book was raised through the Kickstarter crowdfunding platform and every cent raised has been invested into the book to make the quality and finish of this publication as high as possible. A short run of books has now been printed. 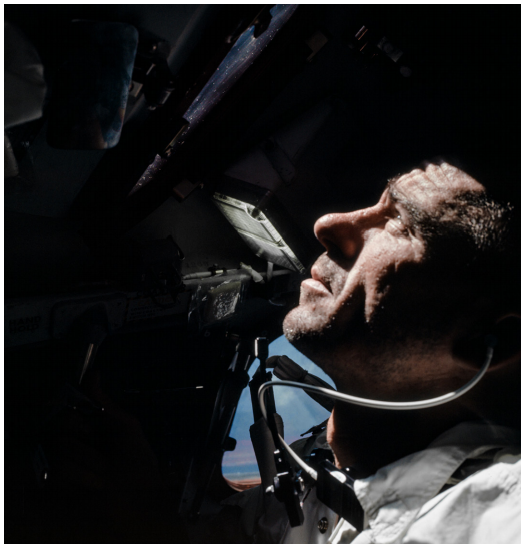 With no Lunar Module to fly on the mission, along with his other tasks Walt Cunningham took nearly 70 percent of the photographs brought back from this pioneering mission. The lessons he learned had a significant impact on the future of space photography in the Apollo project. 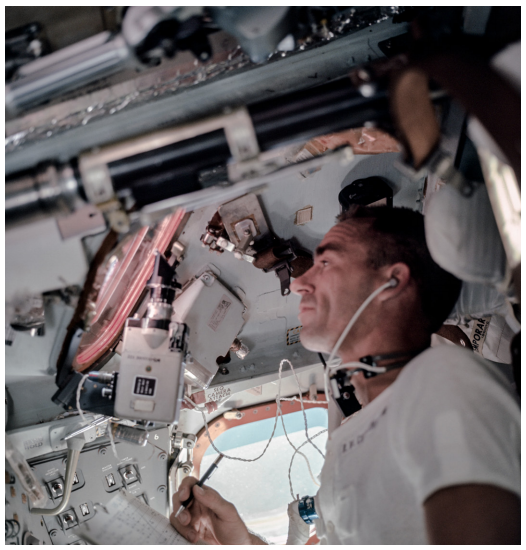 Although Walt said he thought of himself as a physicist and fighter pilot, rather than a photographer, he graciously accepted to write this introduction about his personal experiences and the photographic challenges and problems faced during the Apollo 7 mission.